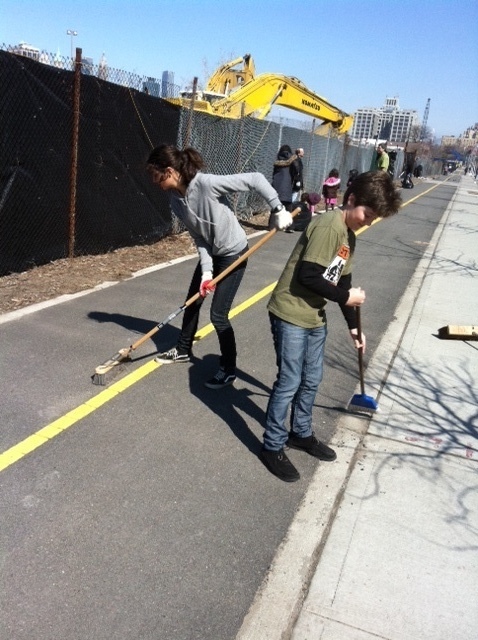 As more people of all stripes use the Brooklyn Waterfront Greenway on Columbia Street to get to and from Brooklyn Bridge Park, an unexpected consequence has come about: Parents are increasingly bringing their wee ones to help with Brooklyn Greenway Initiative’s monthly maintenance program, including sweeping, picking up litter and general tree pit maintenance. Of all the tasks, the kids seem to prefer the excitement associated with using trash grabbers to pick up or unearth discarded material – especially if it’s colorful! When BGI’s monthly clean-up program started in 2008, this was something of a rarity, but now it seems that a new trend has been established. Our first clean-up of the year, held on Saturday, March 12th, drew a dozen participants, and half of them were kids! Here’s a shout-out to our environmental stewards of the future, and a thank-you to parents for their foresight in involving their kids in such productive and fun activities.